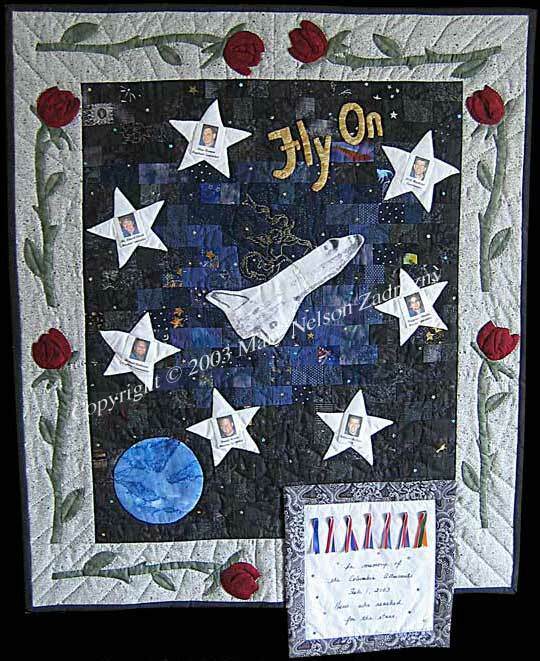 Heroes who reached for the stars"
Quilt Description: A memorial quilt dedicated to the Columbia astronauts who died Feb. 1st, 2003 featuring: a 3-D appliqued rose in the border for each of the seven astronauts, a star with their photo and name, a ribbon bow for each in the colors of their native countries, and an angel wrapping gold ribbon bow around the shuttle. The crew members: William McCool, Rick Husband, Dr. Laurel Clark, Ilan Ramon, Michael Anderson, Kalpana Chawla, David Brown. This quilt took 95 hours to make; each rose taking 4-5 hours to stitch. The background is made of over 340 pieces of blue and black fabrics. Materials: Cotton fabrics, polyester batting. Embellished with star sequins, gold thread, ribbon. Techniques: Machine Pieced, Photo Transfer, Needle Turn Applique, Hand-Painted Shuttle Image, Hand-Quilted.